The first part is always getting an idea. I tend to be inspired by a stitch pattern, a yarn, or a garment shape that gets my creative juices flowing. The next step is to chart and swatch. I swatch a lot and often I make very large swatches. This is were I can try different needle sizes or different yarns. I play with stitch patterns alone and then in combination. Once I have a good idea of the yarn, needles, and patterns I want to use, then I sit down and chart the whole shawl and/or write out the complete directions. I do all the math and make a basic but complete pattern. Then I knit from my own pattern. I consider myself my first tester and I make notes about each step, noting the things I want to include for other knitters. After I’ve completed the sample, I write up the pattern using a template I designed that keeps all my self published patterns looking consistent. At about that same time, I photograph the design so I can use the photos in my finished pattern. Next, it’s time to send the pattern to the tech editor and make revisions as needed. When the tech editing is finished and I feel confident I have a technically correct pattern, I put out a call for test knitters. Sometimes this is the hardest part– waiting for the test knitters to complete the knitting and find out how they liked it! Finally, publication and promotion! I make any final changes based on the test knitter’s feedback and then publish the pattern and share it with the world. I’d love to hear from other designers! What’s your process? I have a new shawl design and I’m looking for test knitters! This is my Roxanne shawl, a rectangular lace shawl with a knitted on border. 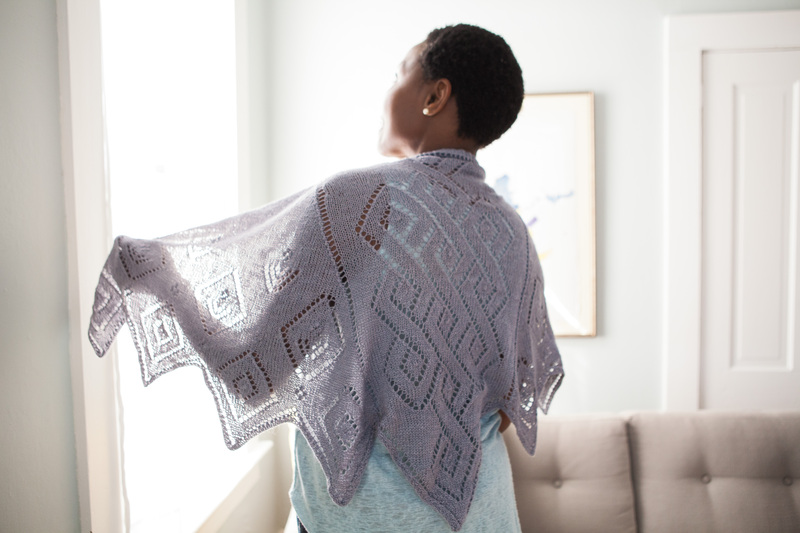 Roxanne is a shawl that celebrates life and growth. Vining flowers and heart shaped leaf motifs combine with a deeply scalloped knitted on border to create a classic lace shawl which expresses both love and hope. It was designed in honor of my midwife, Roxanne, who was with me for the birth of all three of my children. This pattern begins with knitting a long, rectangular lace panel. Stitches are picked up all around this rectangle and a knitted on border is added perpendicular to the existing stitches. Both written and charted directions are given and the knitter may switch between them. If you are interested in joining the test knit, visit my Ravelry group and look at the call for testers for this shawl. As a thank you, I’ll send all the testers who finish by the deadline a copy of the pattern for their Ravelry library and a coupon for one additional self published pattern of mine. One thing that I’ve learned over the past two and a half years is that designing patterns is one thing, but making sure that everything is right is another! My first few patterns were published as free patterns and the only editing and testing was my own. As people started to use the patterns, they found errors, which I corrected, but when I decided my next pattern would be for sale, I decided I should invest in making sure the pattern was as correct as possible before publication. My first step was to find a tech editor. A tech editor looks over the pattern and checks all the math. He or she makes sure that the written directions and any charts work together properly, that the gauge and the stitch count agree with each other, and that generally the pattern is consistent in wording and format. Tech editors don’t knit the pattern, they just make sure the math and wording are consistent and correct. My tech editors have found my copying errors and the occasional math error. They’ve suggested clearer wording for a complex step and noticed when I failed to include an abbreviation in my stitch glossary. No matter how many times I go over a pattern, it seems the tech editor always finds something! Test knitters, on the other hand, actually knit the pattern. They take your directions and make a finished product from them. 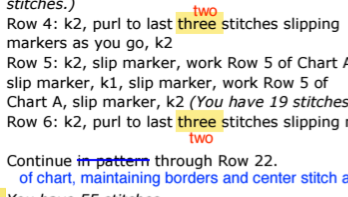 My test knitters have occasionally found errors that the tech editor missed, but more often they give me more procedural feedback– what notes in the pattern were helpful, where they got confused, or what wording makes more senses to them. Test knitters usually provide their own yarn and keep their finished product. I don’t have time to knit a pattern in multiple yarns, but my test knitters almost never use the same yarn as I have used, so I get to see how different fibers and colors affect the finished product. Not only do I get to see the variety of results, but when the test knitters link their projects to my pattern in Ravelry, other knitters can see the possibilities, too! Thank you to all my test knitters! You make the patterns better and for that I am grateful. If you are interested in being a test knitter for me, please join my Ravelry group and sign up on the Test Knit thread. With the publication of my new shawl, the Kerti Shawl, I thought it was time to start a Ravelry group. You can now find me at the Heddi Craft Designs group on Ravelry, as well as on Facebook and Instagram. I am hoping that my group will be a place to support knitters in making my patterns and to run my test knits for future patterns. I’ve had very successful test knits using the Ravelry groups for this purpose, but with my own group I could offer one of my other patterns as additional compensation for test knitting or do giveaways for successful test knitters– things that aren’t always allowed in other test groups. If you are interested in being notified in Ravelry when I have a new pattern to test knit, please come by and join the group and post in the Test Knit thread. I’m very excited to announce the release of my newest shawl design, the Kerti Shawl. It was published this week in an exclusive collection by Knitpicks called Joyful Lace. You can find the collection on the Knitpicks website and on Ravelry. Kerti is a feminine lace shawl featuring center panel with a latticework design. The shawl is worked from the bottom up using a long, stretchy cast on. The bottom border of points is created using a series of charted short rows for each point. The body of the shawl is worked from charts in pairs of two, one for the side panels and another for the center panel. A garter stitch edge is knitted on to the top of the center panel. Elongated bobble stitches called nupps add visual interest and texture. The nupps could be replaces with beads or omitted if desired. I really enjoyed working with Knitpicks on this publication and am proud to be part of such a beautiful collection!